It's been a good decade for superheroes, from The Dark Knight, which just turned 10 years old, to last month's Ant Man and the Wasp. 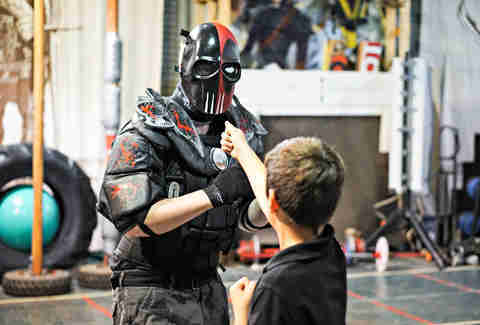 But while Warner Bros. and the Walt Disney Company are raking in the box-office billions, a school in Las Vegas is in the business of grooming a generation of real-life superheroes. And they actually wear masks, punch, and kick. 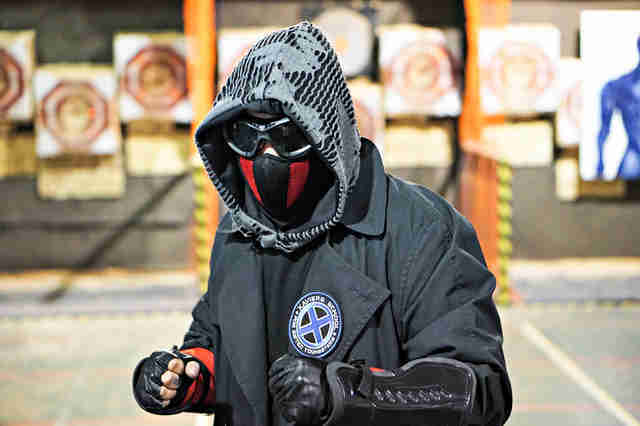 "We believe that every human being has an innate specialty....something that makes them extraordinary," says Dr. TJ Cuenca, a martial artist and the founder and director of the Superhero Foundry, a modified warehouse west of the Strip that teaches students of all ages to channel their inner crime fighter. Classes range from armed and unarmed combat to projectile throwing and what Cuenca calls "functional parkour" -- referring to the freerunning skills seen in Daniel Craig's James Bond movies. "We teach them how to get stronger, how to get faster, how to become a lot more aware of their surroundings," he says. When new students join the Superhero Foundry, they are given seven tests, measuring attributes like speed, pain tolerance, and even hearing ability. "We have a kid here who can hear at the level of a bat," says Cuenca. "We have a guy who can raise the temperature of water by dipping his finger into it." It sounds fishy, but the idea is to help people discover their unique abilities and characteristics, then develop them into a functional set of tools in a controlled environment. The best part? Students are encouraged along the way to develop their own superhero identities, names, and costumes. Take Jeffery, a mild-mannered computer programmer in his 30s. At the Superhero Foundry, his alter-ego is Sharpside, a masked crusader who says his knives and throwing stars are "as sharp as my mind." He's an apprentice to Cuenca and actively involved in classroom demonstrations. Jeffery found out about the program while hanging out at the comic-book shop that just so happens to be next door. "I had been looking for a studio that provides practical [martial arts for] the real world," he says about his decision to go with this over, say, a karate class. He adds that his costume -- now consisting of a dark jacket with an X-Men patch, arm pads, and ski goggles -- will eventually evolve into a more protective outfit, perhaps with a bulletproof vest. "There's a lot of people out there who have different ways of approaching a criminal offense," Jeffery says. "We want to be prepared." Cuenca, of course, has a character of his own: Bladepool, a cross between Blade and Deadpool with a little bit of Batman mixed in. "My costume has layers of D3O, Kydex, and Kevlar to protect against knife slashes, thrusts, and impact attacks," he says. "I have a mask and jumpsuit that is lined with Nomex which makes it fire retardant." Cuenca operates the Superhero Foundry with his wife Melody, a top-ranked knife-throwing champion. The couple also does movie and television stunt work. Rates in the "Superhero Program" range from $100 a month for one day a week (3 hours) to $150 a month for five days a week (up to 15 hours) with most of the classes in the evening. The industrial-style facility has archery targets, a climbing wall, and a "wall of weapons" featuring arms from different eras and nations on display. "Jaws usually drop when we tell people we use all of them," says Cuenca. However, in unarmed combat classes, Cuenca emphasizes knowledge as the most powerful strength for any of his students. The sessions actually begin in a classroom setting, right after everyone faces an American flag and recites the Pledge of Allegiance. "Did you bring your notebook?" Cuenca asks his students. "Write this down. It will be on a test next week." In the classroom, Cuenca -- in full Bladepool garb -- stands in front of a whiteboard and goes over a range of topics: Nevada laws on self-defense, property rights, and concealed weapons. He also discusses and demonstrates how to make weapons out of the fender of a parked car, a water bottle wrapped inside a t-shirt, even sheaves of paper. "That’s my superpower. I can weaponize anything," Cuenca says. "You can take magazines, pee on them, roll them up, and pee on them again," he says. "It hardens and can become a spear." Cuenca says he heard about a prisoner in California who did this to attack a fellow inmate: "It went through his chest and out the other side of his body." 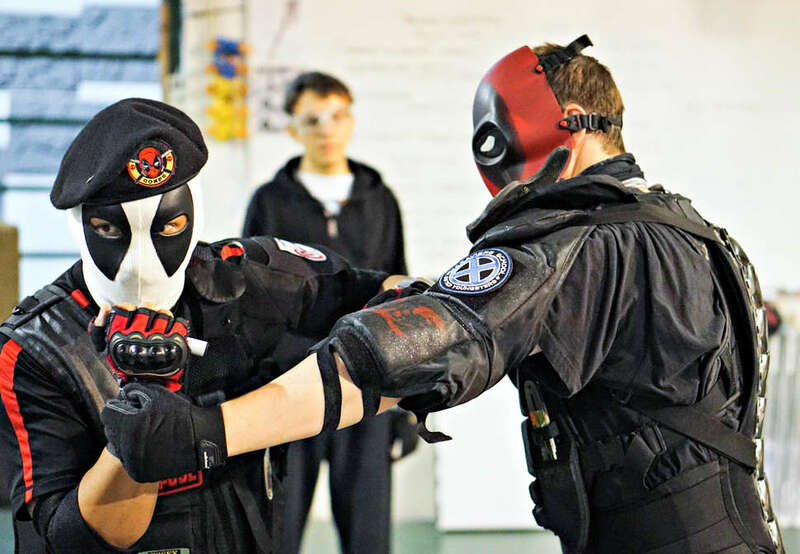 Despite the grisly subject matter, the Superhero Foundry's teachings are more about self-defense, disarming, or distracting an opponent than inflicting damage. "We don't teach students to kill. We teach them not to kill," Cuenca explains. 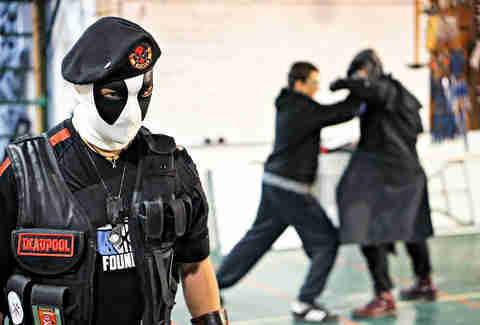 In training, he practices what he calls the "Batman Code," teaching students to go for the hands or other non-lethal body parts: "By doing so, we stop an attacker from punching, grabbing, stabbing, or shooting someone. This ends the attack without killing or seriously hurting someone." The school also tries to weed out bad eggs who might use their training to hurt innocent people instead of help them. "I have an innate ability to sense a person's true nature by watching how they react to open-ended questions during the initial meeting," says Cuenca, a retired dentist and military veteran with more than four decades of martial-arts experience. Students are also given the Myers-Briggs personality test. "If someone shows signs of mental instability or uncontrollable aggression, we terminate their membership," he says, citing the school's need to maintain a healthy reputation. As a few moms watch from the bleachers, the class of about a dozen students breaks down into small groups to practice hand-to-hand combat combinations: how to punch, how to block, and in Cuenca's words, "how to expect the unexpected." These students aren't just acting out fantasies. They're learning skills that could possibly save a life or keep them out of jail. On this day, the oldest student is 35 and the youngest is 10, but they all get to work with each other. Mixing up the age groups also helps kids learn to defend themselves. As Cuenca points out, if a child is attacked in real life, it will rarely be by a person their own size. "We're not just training to be superheroes," says Jeffery in full Sharpside mode. "We're training to be mentors." As for the adults, the Superhero Foundry is developing an elite-level team called Guardians of Tomorrow to work with community groups in organizing a citywide neighborhood watch. To pull it off, the unit is being trained on legal issues, including civil rights and how to make a citizen's arrest. However, Cuenca doesn't want to see his students confused with street performers or cosplay characters on the Strip. The team has already started a campaign to slowly introduce themselves to the public through charity events, working with veterans groups, and teaching first aid or CPR classes. "We're tired of people pointing fingers and pointing out what everyone else is doing wrong," says Cuenca. "We want to be the ones doing right." Rob Kachelriess has been writing about Las Vegas for Thrillist for more than four years. His work has also recently appeared in Travel + Leisure, Supercall, Modern Luxury Vegas, David Magazine, and Luxury Estates International's seasonal publication. His superpower is absorbing large amounts of coffee without a bathroom break. Follow him on Twitter @rkachelriess.